1) Does the secondary mirror need to be as good as the primary mirror? 2) Does Protostar sell "1/30 wave" flats? 3) What kind of coatings do Protostar secondaries have? 4) What is the reflectivity of Protostar secondary coatings? 5) Can I order a special size secondary mirror? 6) If I want to adhesively mount my mirror to the holder, what glue should I use? 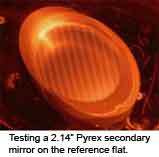 7) What are the differences between the Pyrex and ULS Quartz mirrors (besides the price)? Ultimately, both mirrors are equally important to the final wavefront quality. The secondary's surface is somewhat less critical because it is reflecting at a 45º angle of incidence. This means surface errors on the secondary are only multiplied by 1.4X (instead of 2X for the primary mirror) to get actual wavefront error. Also, the most common form of surface error in the secondary can be partially compensated for when focusing the telescope (you do this without realizing you're doing it). Even considering these factors, a 1/2 or 1/4 wave (p-v) secondary mirror will noticeably degrade the image quality, and unfortunately, there are more secondaries floating around with specs like that than you might expect. A secondary mirror with a true 1/10th p-v edge-to-edge surface rating will not introduce noticeable astigmatism or other error even in a critical star test. Despite outlandish claims, a 1/30 wave peak-to-valley surface from edge-to-edge is exceedingly rare. It's impractical to even test a surface accurately to this level. A $75,000 Zygo interferometer has its 100mm reference element rated at 1/20th, so even measuring beyond this level of accuracy is difficult in itself. Protostar flats are tested edge-to-edge across the entire surface (i.e., no edge masking, or "trimming"). In many cases, much of the surface error is near the edge, so our method gives the most conservative number. Unlike many optics, a Newtonian secondary mirror is frequently optically active across its full aperture, so this is how the optic should be measured. A layer of pure aluminum is applied on top of a very thin bonding layer to improve the adhesion of the metal to the glass. At least two dielectric layers are deposited on top of the aluminum. Dielectrics are very hard transparent materials that improve the reflectivity, but also greatly improve the durability and scratch resistance of the coating. We use a layer of TiO2 (titanium dioxide) and SiO2 (quartz). Due to the very high melting temperatures of these materials, they cannot be applied properly with conventional thermal evaporating equipment, so an electron beam is used to create a more uniform ion cloud in the chamber. The dielectrics are also applied using an ion-assisted deposition (IAD) process. Heavy, inert, ions are accelerated through an electric field, and propelled at the developing dielectric layers. This mechanically pounds, or peens, the layer into a denser structure. This is important because without IAD, the ultra-hard dielectric layers take on a more porous structure, which leads to premature oxidation and failure of the aluminum layer underneath. The average reflectivity across the visible spectrum is 96%. The complete reflectivity curve is shown here. This is not possible since secondary mirrors are made (and coated) in large batches. A clear silicone adhesive (also known as "RTV") should be used. These adhesives are commonly available at hardware stores. If you already have some, but are unsure of its age, we recommend buying a new tube. The catalytic ingredient (acetic acid) can evaporate over time, which prevents the glue from curing properly. Hard curing epoxies are to be avoided. On average, the flatness of the quartz parts is better than Pyrex for a given size. Quartz is a zero expansion glass, while Pyrex is low expansion, which makes it possible to achieve a better surface before removing the parts from the polishing block. (The Pyrex parts will "bounce back" slightly after being allowed to cool to room temperature.) This is why most reference flats are made of quartz (or a derivative of quartz). Quartz is also a harder glass than Pyrex, which is why it takes a smoother micro polish than Pyrex and other softer glasses. This property is especially important for laser applications where low laser beam dispersion is desired.